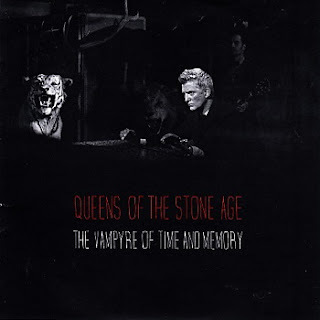 The Queens of the Stone Age have only released the one album in this time frame and what an album it was "...Like Clockwork" was a slow burner for me. At first I thought it was by far the weakest Queens album. But that's because it's so different, so dark, and at times it can be a bit too much. "Smooth Sailing" aside there's very little "joy" or tunes to bop casually to on the album. And the nucleus of this very macabre infused album is "The Vampyre of Time and Memory". Like the album as a whole I didn't think much of the song. I listened to it and it just didn't stand out at all. It just felt a little flat. The first few listens to it and nothing really changed. But all of a sudden, it just hit me. And when it did, the chills that went down me were unreal. The music video can speed up that process if you have similar feelings on the song. When you dissect the song, lyrically, musically and mentally, it's just a piece of genius. It's a stroke of strong quality, possibly one of the finest moments of Josh Homme's career. His voice is just pure melted gold. The piano is incredible. Those blues guitar twangs at the end of the first chorus are just bliss. When he finally says the title of the song, I don't know why but the song just lifts to another level. Like going to heaven. If you think I'm being over the top then I'm sorry but it's how I feel listening to this song nowadays. It's truly an incredible experience and I feel ashamed not to have "got" the song quicker than I did. If you missed #39 go here.